Singapore, 15th August, 2018 — ASUS Republic of Gamers (ROG) today announced that ROG Swift PG27UQ is now available for pre-order. The 27-inch G-SYNC™ HDR gaming monitor is the very first to offer stunning 4K UHD (3840 x 2160) gaming visuals at an overclockable 144Hz refresh rate for the ultimate gaming experience. PG27UQ is the first gaming monitor with DisplayHDR 1000 certification, the top standard for HDR quality, ensuring it delivers superior HDR visuals. Quantum-dot technology gives PG27UQ a professional-grade 97% DCI-P3 and 99% Adobe RGB color gamut for more realistic colors and smooth color gradations, and every PG27UQ is factory pre-calibrated with a color accuracy ∆E value below 3.0. The new customizable lighting features – ROG Light Signal and Light Signature projection kit – provide the ideal gaming atmosphere. In addition, its built-in light sensor automatically adjusts brightness to help prevent eyestrain. ROG Swift PG27UQ is the very first monitor to run 4K UHD (3840 x 2160) content at an overclockable 144Hz refresh rate to provide gamers with detailed ultra-high definition visuals at extremely supersmooth frame-rates. Gamers are treated to unmatched levels of detail, with sharp images and crisp text. Additionally, PG27UQ features NVIDIA® G-SYNC™ display technology for silky-smooth gameplay with no frustrating lag or screen tearing, so gamers get the upper hand in first-person shooters, racing, real-time strategy and sports titles. NVIDIA® G-SYNC High Dynamic Range (HDR) monitors provide a range of luminance that’s closer to what the human eye can experience, and offer a wider color range than traditional monitors. G-SYNC HDR monitors take this performance to a whole new level, with a 1000cd/m2 peak brightness that’s several times greater than standard displays. Its LED backlight is dynamically controlled across 384 zones, providing very high contrast for richer, more natural-looking dark scenes. Furthermore, gamers can plug in their HDR-capable consoles or streaming devices and enjoy highly detailed 4K HDR content on ROG Swift PG27UQ. PG27UQ is the first and only gaming monitor with DisplayHDR 1000 certification, the display industry’s fully open standard specifying HDR quality, including luminance, color gamut, bit depth and rise time that targets not only gaming monitors, but also displays for professionals, enthusiasts and content creators. Featuring an IPS display with quantum-dot technology, PG27UQ provides brighter images and supports professional-grade 97% DCI-P3 / 99% Adobe RGB color gamut. DCI-P3 has a 25%-wider color range than sRGB, resulting in more realistic colors and a wide viewing angle. With exclusive ASUS Aura Sync lighting technology, ROG Swift PG27UQ provides ambient lighting that can be synchronized with a growing RGB ecosystem of Aura Sync-enabled components and peripherals. A built-in ROG Light Signal on the top of its stand lets gamers show their gaming spirit by casting the ROG logo onto the wall, and the Light Signature projection kit allows for the creation and customization of lighting effects that can be projected from PG27UQ onto a desktop surface. ROG Swift PG27UQ is designed for marathon gaming. It uses an ambient light sensor to check the light conditions and adjust the brightness levels. The sensor lowers brightness in dark conditions and raises brightness in well-lit conditions. Also, it includes TÜV Rheinland-certified ASUS Ultra-low Blue Light filters and Flicker-free technology to offer protection against harmful blue light and on-screen flicker. Additionally, ROG Swift PG27UQ features a stand that’s ergonomically designed to offer extensive swivel, tilt, and height adjustments — so gaming is always a comfortable experience with an ideal viewing angle. 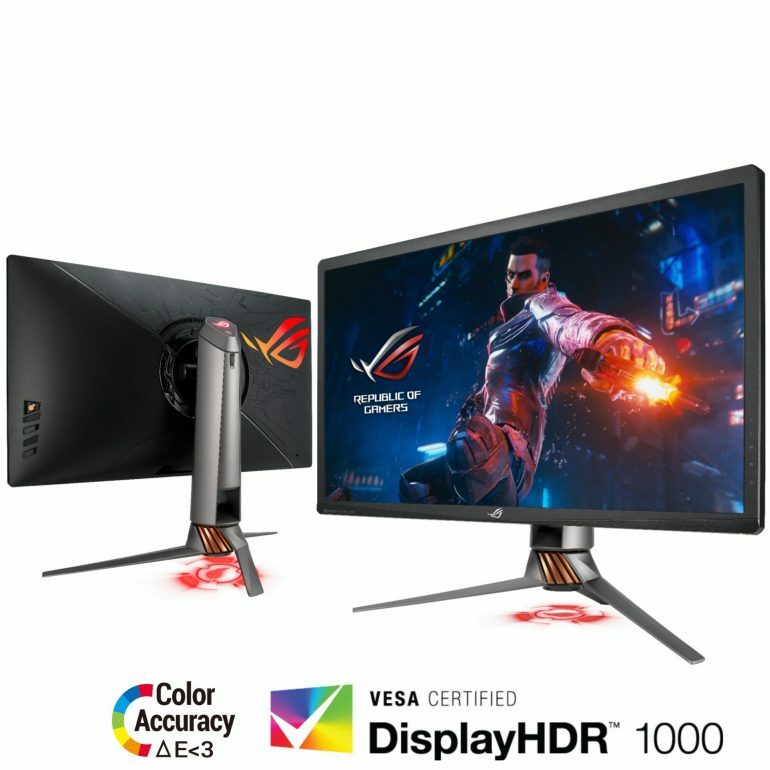 To celebrate the launch of the ROG Swift PG27UQ gaming monitor, ASUS Republic of Gamers is hosting the Join the Future of Gaming online campaign, where participants can enter to win ROG gaming products. To enter, participants should create a short post describing why they want an ROG Swift PG27UQ gaming monitor and share it on Facebook, Instagram or Twitter with the hashtag #ROGSWIFTPG27UQ. Then, they should visit the campaign website where they can join other gamers in an online queue for prizes. The more entries received, the greater the chances of winning. Possible prizes include ROG Gladius II, ROG Strix Flare, ROG Strix Fusion 500, ROG Maximus X Formula, ROG Strix GTX 1080 Ti and ROG Swift PG27UQ.